This most English of games was introduced to this country by missionaries - an early report mentions a game having been played at the Waimate North mission station in the Bay of Islands in 1835. British immigrants also brought the game with them as they settled in their new country. By the 1860's and 1870's inter-provincial competitions were being contested, English and Australian tours were taking place and the popularity of the sport continued to increase. It became clear that its administration needed to be formalised on a national basis and therefore, on 27 December 1894, the New Zealand Cricket Council was introduced. 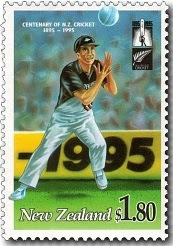 One hundred years later the game is still as healthy and strong as ever and is one of the most popular sports in New Zealand. Women's cricket emerged in the 1920's and a national Women's Cricket Council was established in 1934. 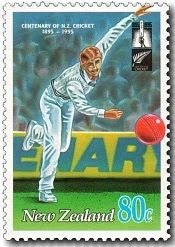 In 1992 the Women's Cricket Council was merged with the board of New Zealand Cricket giving men's and women's cricket a single administration in this country. 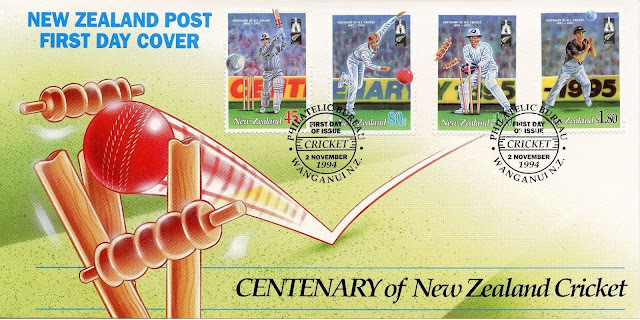 NZ Post marked this event with this issue of four stamps and a ten-stamp booklet. This post is about the main issue while the booklet can be found via the link below. This post of four stamps also included a First Day Cover and a limited edition First Day Cover. 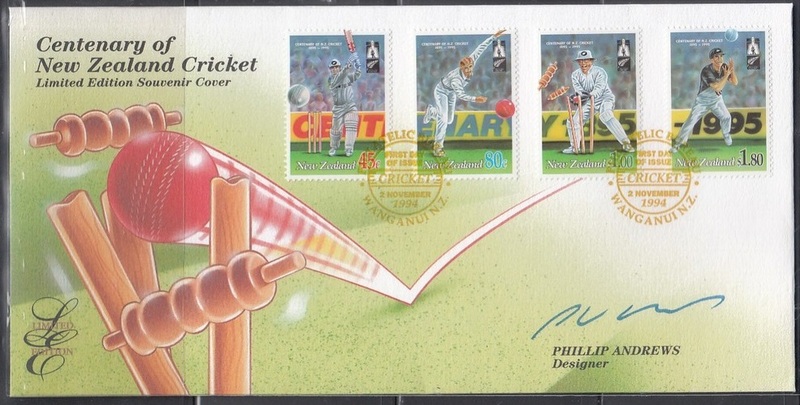 The stamps show four aspects of playing cricket. 45c - Batsman. 80c - Bowler. 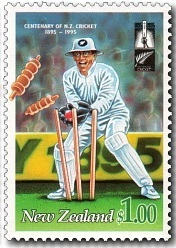 $1.00 - Wicket Keeper. $1.80 - Fielder, Catching. Limited Edition Souvenir cover - 2 November 1994. 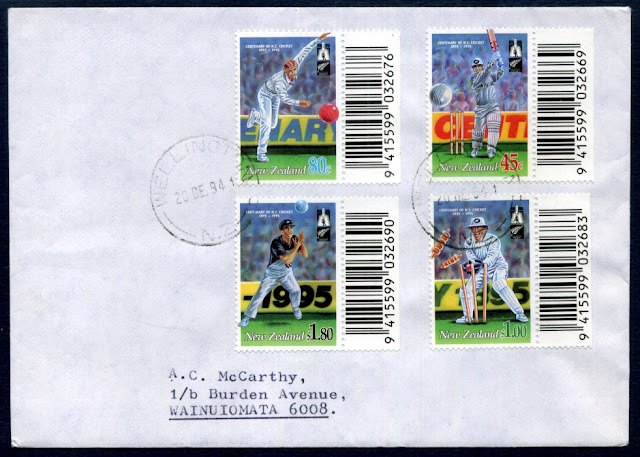 An interesting cover showing all four stamps with their selvedge barcodes. Dated 20 December 1994, this is not a first-day cover. 80c Bowler - Pair with perf shift to the right. Date of issue: 2 November 1994. 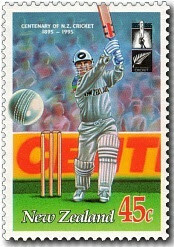 Designers: Sheet stamps: Phillip Andrews, Wellington, NZ; Booklet Stamps: Martin Bailey, Auckland, NZ. Stamp size: 28mm x 40mm; Booklet stamps : 25mm x 30mm. Sheet size: 100 stamps per sheet; ten 45c stamps per booklet. Perforation gauge: Sheet stamps: 13.5; Booklet Stamps: 12. Paper types: Sheet stamps: Coated Papers; Booklet stamps: Harrison & Sons, red phosphor coated, unwatermarked. 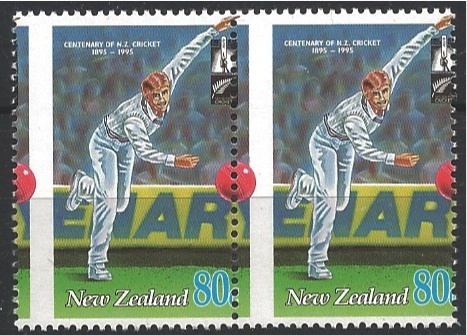 Period of sale: These stamps remained on sale until 2 November 1995.